And now is the time. With the tools at hand, the language of the elements, and your powers, you are asked to create the most of the best to the greatest for the least. Your calm acceptance brings you forward to the task. From the clays of the earth you must begin, joining the history of known mankind and enter into true creation. Clay is the natural live medium that is known to generate and maintain life. Greasy earth clay comes in many different colors, is known by many different names, and each has its own properties. Share in one of humankind’s first inventions. Explore crafting culture. Your strength lies in your journey. Once human, you are now more. Your power lies in the magic of the medium! 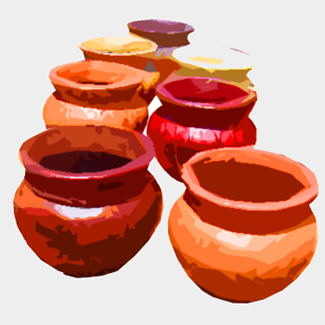 Form a ceramic pot using self-hardening or oven-baked clay. Soften clay by adding just enough water to make it malleable and workable but don’t add too much! Some clay may not need water added. Work the clay by moving it around in your hand and form it into a ball. Next, flatten the ball by pinching it between your fingers and thumbs. Keep pulling the outside edges upward to form the vessel. 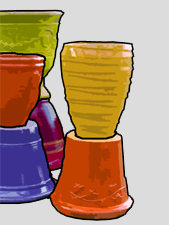 Try to make your pot a uniform thickness while pulling the sides up, making them thinner. Continually turn the piece in your hands to make it uniform. Soon you will reach the desired shape. After it has self-hardened or has been fired in your oven, paint your piece as you desire. Photograph your ceramic piece. Ceramics! You have now shared the artistry of the ancients! 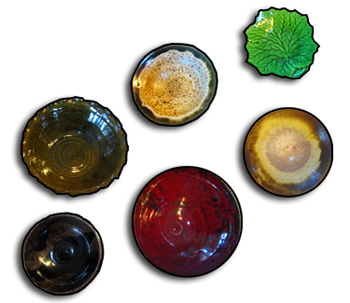 Ceramics have been the base material for ornamental objects as well as functional vessels. With the ease of working the material, decorative shapes were fashioned to adhere to cups, bowls, saucers, and other culinary objects as well as architecture. 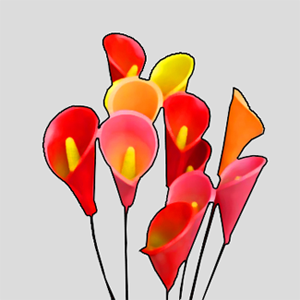 In this activity, imagine a flower garland or other type of arrangement. Take the clay as in activity 1. After forming several different sizes of balls, manipulate the clay by pressing, and pulling into petals and leafs. Connect the petals into one flower, or a series of flowers by pressing them together and connecting them onto a rolled vine. Complete by attaching leaves. Dry or bake your arrangement and paint. Photograph your ceramic ornament. From the earth comes flower power! Different cultures live in different areas of the world and have access to different soils and clays. The very make up of clay can change the color, form and strength of the ceramics that are created. Different cultures also create sculpture and objects for different reasons, decorating them with their signs, symbols, language and stories. Research ceramics. Find the oldest to the newest processes. Make a timeline of ceramic pots! People throughout history have crafted vessels and ornaments from material from the ground mixed with pigments and glazes. Take a look at the history of ceramics and look at different glazing mixtures and processes. Find one that you like and research its origins and its uses. Become knowledgeable about ceramic processes! __________ is used to heat pottery. Pottery is traditionally fired in a __________. Which one is ceramic made of? Ceramics date back how many years?